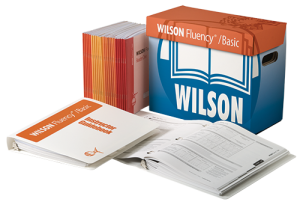 Wilson Fluency®/Basic Kit can supplement any reading program that introduces short vowels in words with progressively more challenging patterns. It is appropriate to use with the Wilson Reading System®(WRS), Just Words®, and Fundations®. Student Record Pack: Students’ progress on each passage is charted by the instructor in each student’s individual record book. Student Fluency Readers: Each Fluency Reader contains five stories with reading passages of 200-300 words and corresponding wordlists, phrases, and phrased and unphrased passages. Fluency Readers 1-3 correspond to WRS Steps 1-3, and the Basic Reader includes additional decodable stories that correspond to an enriched passage. Each kit contains a set of Readers to accommodate six students. For more information about specific instructor and student materials, please see our catalog. To order materials please visit our online store.